Subaru Symmetrical AWD! Power Moonroof! Navigation System! Premium Stereo! Alloy Wheels!Legendary Subaru Boxer engine w/Subaru Symmetrical AWD. Room for 5-passengers, cargo and loads of fun. Bring your picnic basket, friends and head for the outdoors. 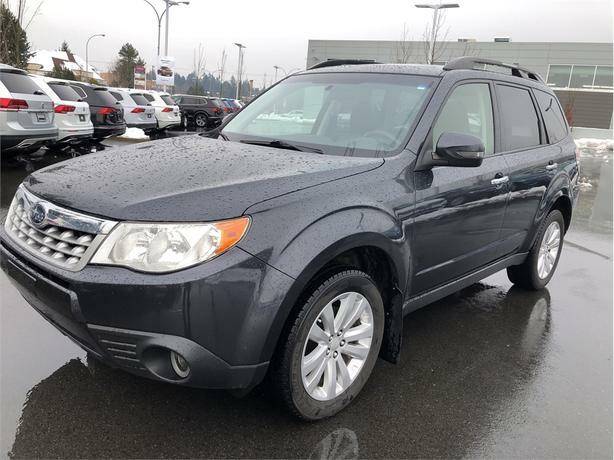 Key Features: Multifunction steering wheel with handsfree Bluetooth connectivity, Pioneer entertainment center w/touchscreen, CD player and micro SD slot, Power driver seat, heated front seats, Power moonroof, leather seating surfaces, cruise control and air conditioning.Questions? TEXT 778-949-9028 for more information about this vehicle.----------------------------------------------------------------------------------------Harbourview Autohaus is Vancouver Island's Largest Volkswagen dealership. A locally owned family business, The Wynia family have strived to make customer service a priority, which is reflected in their over 35 years of operation in Nanaimo. From their humble beginnings in downtown Nanaimo, to their current location at the corner of Mostar and Wellington Road, Harbourview has grown with the community we are so proud to serve.Why buy from Harbourview Autohaus? Local and Family owned. Low and Flexible Financing Options. Carproof Verified Reports on every pre-owned vehicle. 112 point inspection process with full vehicle history. Volkswagen Certified Pre-Owned Program. Thoughtful, friendly, and knowledgeable staff are well trained and respect your time. A full service department with Customer lounge, free coffee and TV. Complimentary shuttle for service appointments. All Harbourview Autohaus vehicles come with nitrogen filled tires.Please be advised that our advertised price does not include our $399 documentation fee and our $399 registration fee.